In the cabbage patch, the brassica family now includes a wide range of oriental vegetables—all easy to grow. Pak Choi, Mizuna, Japanese Mustard Spinach, Oriental Mustard and Komatsuna are among the most common varieties. Sow in summer and they will ramp away—thin, and pick regularly to prevent bolting (though not a major problem) and to keep them down to size! 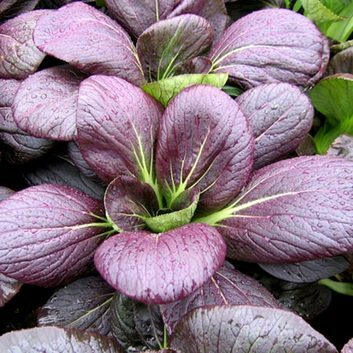 Pak Choi 'Purple' F1 hybrid (Brassica rapa) is a hardy annual with beautifully coloured leaves. Harvest young leaves for salad in 30 days or as a mature head at 45-70 days for a succulent addition to stir fries. Companion plant with a pot of mint for beetle protection.